Ryan turned 3 and it was time to get him out of floaties and swimming on his own! He recently completed his first set of swim lessons with Swimming Success and I'm so happy with the results! The main reason we signed Ryan up for swim lessons was for his safety in and by the pool. We don't have a pool at our home, but we do have a jacuzzi. Even though it's situated on our gazebo, which is closed off by a gate, I want to know that in the off chance that the door is mistakenly left open by our gardener or one of us, Ryan will be safe should he ever accidentally fall in. Scary to even think about! We're also planning a family trip to Hawaii this summer.. so I'll feel a lot more comfortable knowing at least one of my babies is "pool safe." Note: Swimming Success may be a sponsor and the products featured in this article may contain affiliate links, but the opinions are my own and I'd recommend them to you anyway! I wanted to share a little more about Swimming Success before I get into my journal of Ryan’s swim classes. Firstly, I have to mention how kind and professional everyone on the team is. That was apparent right from the start with our first phone call to schedule classes. Owner and teacher of the swim school Karalynne was trained 27 years ago in a Swedish swim method and over the years she implemented other techniques to create her own renowned Swimming Success method that gets kids swimming in just 8 days! All of the swim teachers at Swimming Success have to have been on a swim team or had equivalent swim training, taught children before, and trained in the Swimming Success method. We loved our instructor, Nate, but also love knowing we have a pool of excellent instructors to work with for refresher classes should Nate ever not be available. Because the lessons are private, the instructor can move at the individual’s pace and get them through as many of the 100 skills as possible. The instructor can tailor their focus or personality towards the kid's needs. Because it's 8 days of instruction close together, the child can learn new skills each day. When it’s a once a week program, the instructor has to spend time reviewing what the kids learned the previous week rather than learning new skills. Because this method is one of persistence and firmness with the kids, but patience and fun at the same time. With this method, the children work hard their entire lesson while having fun. In the end, the parents can expect to see great results. Believe it or not, the best age to enroll kids is 3 years old. At 3, they can be swimming and water safe in 8 days. Being a busy mama, I love that the commitment is short and sweet! Swimming Success offers classes all over LA and will also come to your private residence if that is preferred. The most important thing.. swim trunks. I love the cute styles that Gap has available. Ryan was styling in his shark print swim trunks. I like to keep my little guy’s upper body protected from sunburn with a rash guard. I love these Native slip on sneakers for pool time, the beach, and when the boys need something to protect their feet when they’d rather be barefoot. SUNSCREEN! You know which one is my fave! These little Ray-Ban sunglasses are perfect for summer and protecting those precious eyes. When you're a mama it’s always important to be prepared. My #happymom tote was perfect to bring with me to every class. It’s lightweight and able to hold all of the must-haves. Snacks: When learning to swim kids use up a lot of energy. I made sure to pack a banana or bar for Ryan to snack on after class as well as his water bottle to keep him hydrated throughout the session. Towels: I bring not one but TWO towels.. 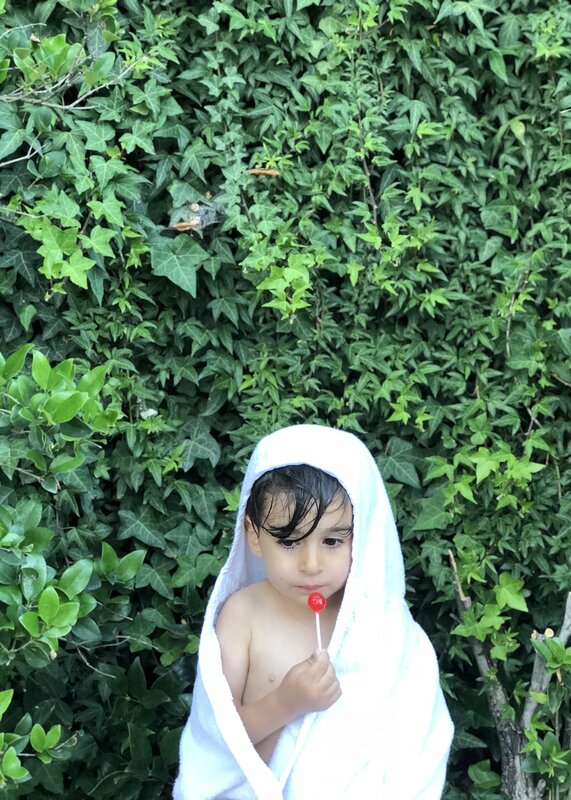 It's good to have one ready to go for when your little one comes out the pool for a hug after the lesson... and then, that one's drenched... which is why you need towel #2. Wet Bag: The Bumkins Reusable Waterproof Wet Bag has been a life saver hands down. I put Ryan's wet swimwear in right after he gets out of the pool and don’t have to worry about everything else in my tote getting soaked. Clothes: A change of clothes is a must for after drying off. There were many ups and downs, but Ryan was a great sport through it all. Even though he was quite nervous a lot of the time during lessons, his instructor, Nate, was there to support him 100% of the time. Ryan just completed his first day of swim school!!! His instructor Nate made it super fun for him, you could tell Nate had a ton of experience working with kids Ryan’s age. As you can guess, Ryan was a little reluctant at first to get in the water and he did shed some tears (and screams for mommy), BUT there were a lot of laughs and happy moments too. Nate reassured me this was completely normal. He got to swim around with a rubber ducky which made it super fun for him. He also learned to kick and float on his back in a starfish position with Nate’s help. And he went around the pool while holding the wall... what the swim school calls "going on the bunny trail". Of course the whole time he was enticed by a plate of lollipops waiting for him. We told him that if he finished his lesson successfully that he’d get a lollipop… sure enough day 1 was successful, he did amazing, and he enjoyed his lollipop. We can’t wait to experience day 2 with Nate tomorrow. So today swim class was tougher on Ryan and me as I watched from the sidelines. He didn’t even want rubber ducky to swim with today. The little guy had a tough time going underwater. It was tough for Ryan to grasp, but Nate said that's completely normal especially for his age. Kids start to realize pretty quickly that it doesn't feel too good to swallow water and they get tummy aches later on from it and they figure out how to handle being underwater. Nate worked on blowing bubbles underwater with Ryan while keeping their mouths shut. Semms like a lot for a 3-year-old to comprehend right?! Somehow he figured it out. Ryan practiced using his hands to walk alongside the rim of the pool, kicked and practiced his arms and swimming forward in the pool, and practiced the starfish floating pose again. In the end, he was happy, but he was done with it. He made a mad dash to his warm towel and lollipop at the end of class. Ryan was reluctant to go to swim class today… he cried and hid under the dining room table. I think it’s because he remembered how his head went under the water on day 2 and he didn't want to do that again because it was scary for him. With Daddy’s help, we got him in the car and we were on our way. Through his tears, we had a little pep talk about how awesome class was going to be… how much fun he was going to have… and most important, how great he was doing. I kinda bribed him a little too. One thing that got him through the first two days was getting a lollipop at the end of class. I said to him, what if today we asked Nate to give you two lollipops at the end of class? He immediately stopped crying when he heard me say that and in his sweet little voice he said, yeah can we do that. I told him on order to get the lollipops that he couldn’t cry during class and needed to follow directions. I was so proud, he barely cried, it was more like moments of nervousness. He did the sweetest thing that I’ll never forget… it was in the middle of class when Nate was praising him for not getting water in his mouth, and Ryan asked, "can I give mama a kiss?" Of course, I couldn’t resist. Although the day started out rough, he had a great day 3, there were lots of high fives. We just completed a fun day at swim class with Nate from Swimming Success! Ryan was still a little bit reluctant to go to class today, but he was amazing once he got into the pool. He had so much fun with it today. He did a lot of the same things… underwater swimming with Nate’s help, walking with his hands along the rim of the pool, and floating like a starfish on his back. He did have a few crying moments today, especially when he first learned that he would be jumping in and swimming to Nate alone. I'm super proud of him... he faced his fears, jumped in, put his head under the water, and swam by himself for a couple of seconds until he reached Nate. Ryan got a special lollipop from Nate at the end of class today because he was extra good. I think that made Ryan bond with Nate a little more. He even gave Nate a sweet hug today before he left, it was super sweet. Day 4 is complete and he is making great progress thanks to the Swimming Success method! We just finished swimming success day 5 and Ryan had an awesome day today! We celebrated with some cheeseburgers from In-N-Out Burger! Although Ryan did cry a lot, I did see him swim a ton by himself to Nate with very little help today. It was super special to see. He would swim all the way to Nate in the center of the pool and back. and climb out by himself. That right there was the reason I signed him up for swim school. I want to know that if he falls into a pool or jacuzzi that he could swim to the wall by himself and be safe. 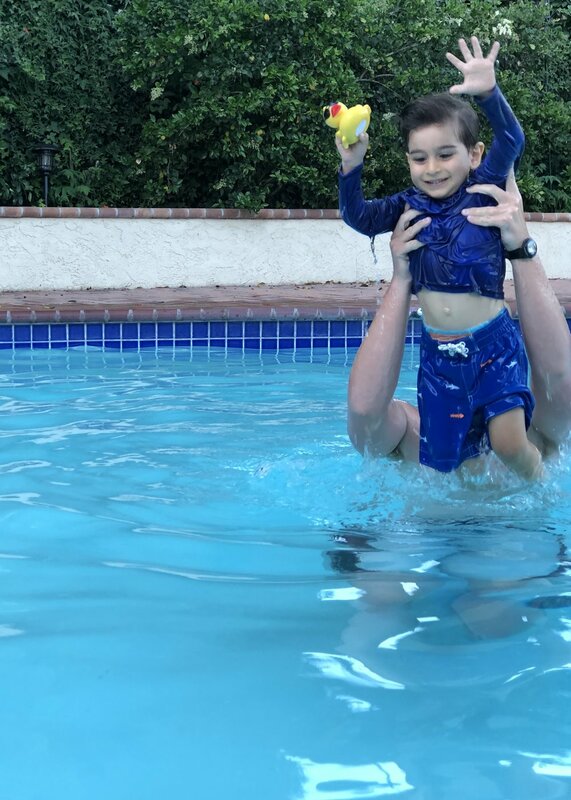 In addition to swimming far distances by himself under water and making it to his instructor Nate on his own, Ryan also jumped in today, did his bunny walk alongside the rim of the pool, and did his floating starfish. Instead of leaning his head on Nate’s shoulder for the floating starfish, Nate put his hand under Ryan’s back and that freaked him out a bit. He cried a lot of the class and I think it was because he had to do a lot more unassisted swimming which scared him. He told Nate a few times that he was going too far because Ryan wanted to know that he could reach Nate with his hands if he needed to. I'm super happy with what I'm seeing with Swimming Success and can’t want to see him progress even further. We're going into the weekend so Ryan will have completed 5 lessons, will have a break over the weekend and will have 3 consecutive days of lessons next week. So we just got home from day 6 of Swimming Success and today was by far the HARDEST day of the swim training. It was hard to watch Ryan today. He cried a lot... and it broke my heart. I talked to Nate about it and he said it was common for two reasons… he had a break for the weekend and it’s always harder to get back into the training after that. AND day 6 is the toughest material. He ended up swimming alone to his instructor, Nate, in the middle of the pool, took a breath and swam back to the wall. The goal today was to teach him, with Nate in the pool of course, that his goal is to get back to the wall no matter what area of the pool he was in. At one point he was so fearful that he ran towards me saying he didn’t want swim anymore. I put him back in the pool and he got out again... this time he tried to make a mad dash for the gate. At least he knew how to get out! Nate reassured me he wasn’t the first kid that has tried to escape and that made me feel better. I’m proud of my little guy for pushing through and getting to the end of class. It was a bummer for him at the end though, because Nate ran out of lollipops. We just left swimming class day 7 and here are my thoughts after what is considered his final session. It’s supposed to be 8 consecutive days of training (5 then the weekend off then 3 more), but as I mentioned we missed Monday because Ryan threw up on the way to class. So instead of 8, he’s gotten 7, but his safety training, as I call it, is complete. He’s doing really well swimming to his instructor and swimming to the wall, but he is still crying a bit (because he is still fearful of swimming on his own under the water) but his instructor said that this is very normal for a 3-year-old. Nate says Ryan is considered pool safe and could swim back to the wall and keep himself safe in the water. He also said Ryan is actually a very good swimmer and he is fast and he gets where he needs to be. The fear is normal. I’ve decided to take a week or two off then sign him up for a second series so he can continue to move forward and get to a place where he is enjoying swimming and he's passed the fear. In the meantime, we’ll continue to practice in our jacuzzi and bathtub so he doesn’t regress. My goal now is for him to strengthen the skills he has already built and to happily jump in the pool for a swim. I'm extremely happy with how far Ryan has come from when he first started swimming with Nate! Mamas, I want you to know that it’s important to be open minded and flexible when doing a training like this. Remember, at 3 to 5 years old, with initial swim training what's important is that they are able to be safe in the pool and get to a safe place (the wall or stairs), and not to become an excellent swimmer. Your kids are still just itty bitty and can be more fearful than older kids when it comes to water. Be prepared to do a refresher session for your babes to feel more confident. Swimming Success is so kindly offering Land of Mom readers 10% off classes for your little swimmers, just mention Land of Mom when you call to reserve! I hope this blog was helpful! Leave a comment below to let us know if you plan on enrolling your littles in a swim school this summer.